snowdeal.org > ex machina: the eric update - day 307: a future tar heel? 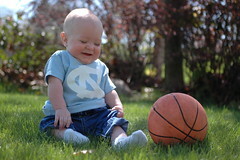 the eric update - day 307: a future tar heel? much to the chagrin of certain michigan state fans ( d'oh! ), kelliamanda was kind enough to send odin his latest collegiate t-shirt from the university of north carolina in chapel hill - home of the tar heels. That is an adorable picture!! What a precious grin on his face. Happy Mother's Day to Odin's Mommy!!! No worries about the doll, Dad. Before you know it the doll will be strapped to parachutes, frightening small Lego people, and duking it out with Godzilla. Odin is a cutie pie!!! "No worries about the doll, Dad. Before you know it the doll will be strapped to parachutes, frightening small Lego people, and duking it out with Godzilla."